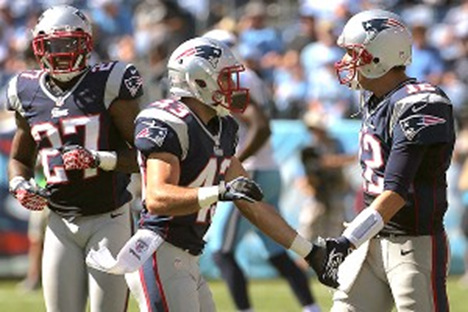 Ebner, a relatively unknown sixth-round pick for the Pats, finished the regular season second on the team with 17 special-teams tackles (14 solo). FOXBOROUGH, Mass. -- When the Patriots selected Ohio State safety Nate Ebner in the sixth round of the 2012 NFL draft, it had many scurrying for information. Ebner wasn't a highly touted prospect, had hardly played defense at Ohio State, and didn't take part in the NFL combine. His career highlights were more rugby-related (he was a world-class player) than football-related. But as is usually the case, the Patriots had a plan and a specific fit in mind. If things went according to plan with Ebner, he'd be a core special teams player and a developing prospect at safety. That's how it turned out, as Ebner finished second on the team with 17 special teams tackles (14 solo) during the 2012 regular season. Only special teams captain Matthew Slater had more (20). The 24-year-old Ebner, who hails from Dublin, Ohio, shared his unique "football journey" with ESPNBoston.com this week. When he first started playing football: "I played from 6- and 7-year-old through middle school. Those were my running back days. But then I didn't play at all in high school [Hilliard Davidson]." Why he first started playing football: "My dad [Jeff] and his influence on sports. Also, all my best friends were playing." Why he stopped playing football after middle school: "I was raised in Cincinnati in my young years until sixth grade. I went to my last year of middle school in Columbus so that changed. My body type, I was a late bloomer. I didn't grow a lot and wasn't really into the football as much. I wasn't as big. Also, I wanted to play running back and they wanted me to play quarterback and safety. Between that, and also playing rugby with my dad, I enjoyed that more." Why he eventually came back to football: "I wanted to play football my senior year of high school. I debated it. But I also had a Junior World Cup [for rugby] that I had already committed to in the spring. I talked with my dad about it and I went to meetings with the coaches, but it didn't end up happening. I was concerned about possibly getting hurt for the World Cup, which was my main priority at the time. I wasn't sure about playing football in college, I just wanted to play with my friends, and I also didn't feel good about going out there and taking someone's spot that had been there for four years. They won the state championship that year, so it wasn't like they needed me or anything. Then going into college, I couldn't play on any traveling professional rugby teams because I was committed to college. I was playing at the club collegiate level, and I struggled with that as far as the competition level. It wasn't against the best guys in the world. You were playing college club teams. That was hard for me, how serious I was taking it. So it was a mixture of those two things -- not playing when I kind of wanted to my senior year [of high school] and then just not getting the same competition level I had been used at the World Cup level." How he approached Ohio State football about walking on to the team: "I got in contact with the guy I needed to get in contact with, and asked when the walk-on process was, and what does it entail? I started to train for that type of stuff, and the rest is history. ... The end of my second year of college, I walked on in the winter. My first season was going into my third year of college [Ebner was at Ohio State for 5 years, playing 3 seasons]." Best football memories at Ohio State, where he was voted by teammates as the Buckeyes' most inspirational player: "I'd say it was running the [American] flag out in the September 11th game last year. I think at the time, I didn't realize how big of an honor it was. Looking back on it, especially after it happened, and just hearing the crowd ... they always cheer when we come out, but to hear them cheer the American flag on September 11th, it was awesome. And for me to lead the team out and have 110,000 screaming their heads off, I'd say that was my favorite. Obviously everything playing football, there are memories I can look back at and a lot of good things, but that one sticks out. Getting a sack was cool too, but the [flag] was better." Being selected in the sixth round (197th overall) by the Patriots: "I don't even know where to begin on that one. Every kind of emotion you can imagine -- from extremely excited, to what an opportunity, to feeling that hard work was paying off. There was satisfaction for me, because of what I always felt quietly in my own mind about what I could do. Now it was being seen by other people, an NFL team thinking enough of me to draft me. It was cool for me with all the negative stuff; it's why I don't listen to that stuff." Describing life as a Patriot: "It's awesome. It's the life. It's a great organization, great people, great attitudes. Everything you could want in any type of work environment -- to be part of a team that is so driven to win, where success is the only option. It's cool to be a part of something that holds itself to such a high standard." Role models in his life: "My [late] dad was my only role model. Looking back on it, you had your favorite players, but they were just players. But a role model, and the way you carry yourself and how you go about your work -- what hard work really means -- and to be a man ... every aspect of life. To me, my dad was that role model, 100 percent. There wasn't anyone else I wanted to be like than him." Favorite teams growing up: "Obviously, I was an Ohio State fan. I didn't really have a favorite NFL team. When I started to become a fan of sports like that, I was playing rugby at the time." Favorite players growing up: "I didn't really have any, but I liked Ronnie Lott. That was before I was playing safety. I liked John Lynch too." On highs and lows of his rookie NFL season: "I can't even say that right now because we still have a lot left. I'm still excited. I don't really try to look at it like that -- highs and lows -- and just try to stay even-keeled while getting better. When I see growth in myself as a player, and being able to help the team, those are the types of highs for me." What he loves about football: "I love tackling, but the thing I really love about football is the explosiveness and speed of every play. You stop after every play. In rugby, it's a very fluid game and you have to have endurance. In football, you have time to rest and it's just so explosive. There are real explosive players out here." Summing up his football journey to this point: "I guess I've always been driven to push myself and not be afraid of anything -- if it's something I wanted to do, I put my heart into it 100 percent and give it my best effort. You have to believe you can't fail, and have that confidence in yourself and from the close people around me, and not worrying about anything else. It's just working as hard as you can if it's something you truly want. That's been my journey."